I started collecting recipes quite a while ago. 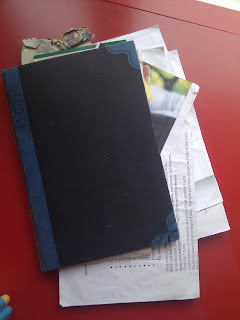 In fact, the address I have written in the front of this recipe book (in case I lost it in a public place and someone wanted to return it to me - WTF?!) is 6, rue Francisque Sarcey, 75016, Paris. My sophisticated carbon dating equipment tells me that this dates it to the early 21st century - around 2001-2 to be precise. Back then, I was under the illusion that at some point in the future I would "grow up" - that's also the reason I kept the Port Meirion Tea Set. I distinctly remember justifying it to Ross by saying that when the vicar came to tea, we'd have something reasonable to serve him from. What was I thinking? So yes, I thought I would grow up, but I never ever thought that I would employ a maid. I collected all these recipes for the time in the future when I was grown up and cooked dinner for my husband once the kids were in bed. That hasn't quite come to pass. Sometimes I think about what it would be like to take Vergenia back to the UK with us on holiday. And I wonder how on earth I would explain the situation.